On Wednesday 31st May Billingham Forum helped play host to the Royal Air Forces centenary celebrations. The RAF started a 100 day baton relay at the start of April and are travelling across the country and abroad until its finale on 10th July at the Horse Guards Parade. The baton will be carried by a host of willing volunteers that all have a personal connection with the RAF. 100 sites associated with the RAF will be visited over a period of 100 days using several modes of transport. 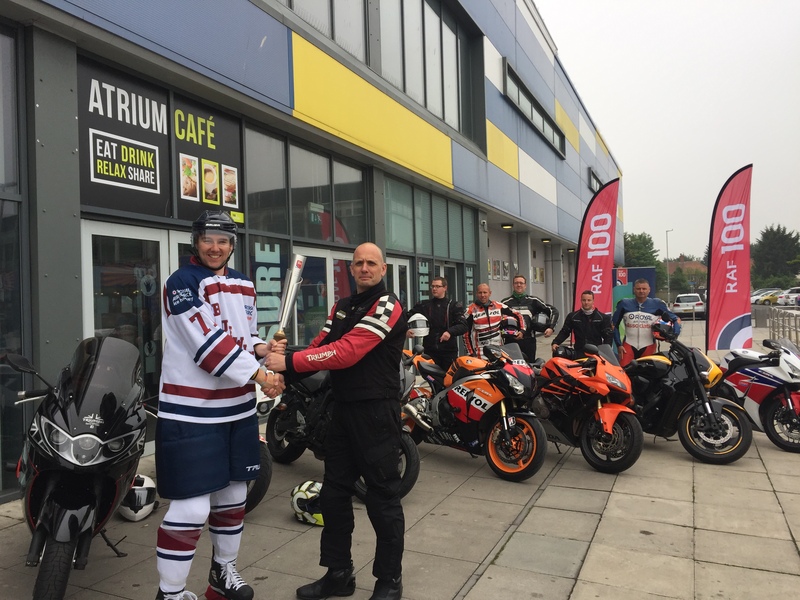 On 31st May a fleet of superbikes headed south carrying the baton from Newcastle to Leeming Bar and stopped off at Billingham Forum Ice Arena on their way. After arriving in style at Billingham Forum Ice Arena, RAF members from different regiment’s ice hockey teams took to the ice in order to complete 100 laps of the ice rink to tie in with the 100th year celebrations. After some high speed skating and a couple of slips the laps had been completed. A short game of ice hockey followed before the baton was on its way to its next location of RAF Leeming.